Indian Prime Minister Narendra Modi arrived in Britain Thursday for a visit that will see him address Parliament, lunch with Queen Elizabeth II and sign billions in business deals with India's former colonial ruler, now an eager economic suitor. 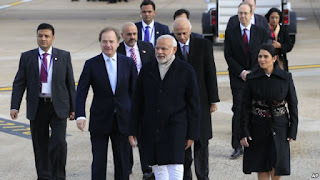 Although it is not a state visit — since Modi is not a head of state — the Indian leader is being treated to full British pomp on a trip that comes amid rising troubles for him at home, where economic growth is slowing and political criticism is growing. He will be welcomed with military ceremony, hold talks with Prime Minister David Cameron and address Parliament on Thursday. On Friday, he'll lunch with the queen and hold a glitzy rally, complete with fireworks, for thousands of supporters at London's Wembley Stadium. Cameron's Downing St. office said Thursday that the two countries expected to sign billions of pounds' (dollars') worth of commercial deals during Modi's visit, including a plan for London's financial district to become a center of offshore Rupee bonds. "This isn't just a historic visit; it's a historic opportunity," Cameron said, calling India and Britain "two countries tied by history, people and values." But Sikh groups and human rights activists plan to protest appearances by Modi, a Hindu nationalist who has been accused of failing to stop growing religious intolerance and violence in India. More than 200 writers, including novelists Salman Rushdie, Ian McEwan and Val McDermid, signed a letter expressing concern about what they called "a rising climate of fear, growing intolerance and violence towards critical voices" in India. They urged Cameron to tackle Modi on rights abuses during their meetings. India and Britain have close and complex ties dating back to Britain's time as colonial ruler until the mid-20th century. Nowadays, Britain is eager for more access to India's fast-growing economy and market of 1.3 billion people. Indian firms have also made major investments in Britain, including Tata Motors' ownership of automaker Jaguar Land Rover. 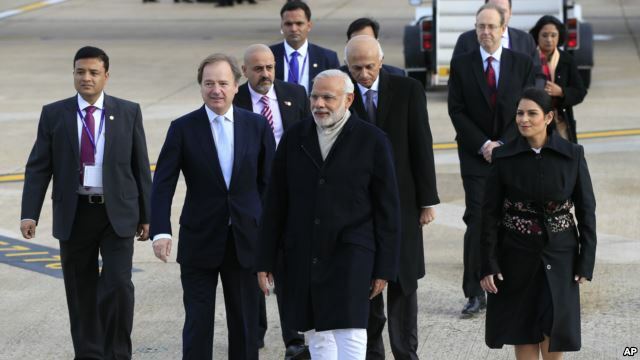 Modi is due to visit a Land Rover factory in central England on his trip. Modi swept to power in 2014 on promises to develop India's economy and root out the corruption and incompetence that had crippled the previous government. But his Bharatiya Janata Party suffered a recent drubbing in an important state election widely seen as a referendum on Modi's popularity. And India's economic growth is slowing, although it still outpaces much of the world. Modi has not always been welcome in London. Britain and the United States both barred him after 2002 anti-Muslim riots killed at least 1,000 people in India's western state of Gujarat, where Modi was then the top official. Muslim leaders and human rights groups said Modi did little to stop the violence, a charge he denies. India's Supreme Court has said it found no evidence to prosecute him for the violence.